If you need a divorce by consent, default, or by mediation- and there are no children involved, this is the correct choice. * Our fee DOES NOT include court fees. We take care of all child support documentation, child custody agreements, parenting time, and spousal maintenance, if applicable. Jessica is great to work with! I have used her services twice and both times she exceeded my expectations with her knowledge, timeliness and affordability. I would highly recommend her for any legal document needs. DivorceRespond to Petition for DivorceChild Custody or Support IssueQuit Claim DeedQDROWill / Power of Attorney / EstateSomething else? Yes, and we agree about it. No, we can't agree about splitting things. modify an existing order regarding custody / support. register orders from another state. Yes, we agree about custody and visitation. No, we can't agree about custody. I do not know if we agree, but I DO KNOW where my spouse works or lives. I don't know where my spouse is at. This means you have a current plan, or you have intentions of making plans. You know how you'll share custody and divide assets. Email or telephone is fine. Our Phoenix-based legal professionals can help you with any divorce paperwork you may need whether it involves children, division of property and/or alimony. We can establish Arizona child custody, legal decision making authority and parenting time, or petition to modify a current child custody and parenting time order. We can work a child support agreement into a new divorce, modify an existing AZ child support order, or file a petition to enforce (in case he or she isn’t paying). People sometimes choose a legal separation rather than an Arizona divorce, perhaps for religious or financial reasons. Whatever the reason, we can help. We are an Arizona Company, with Arizona employees, who spend money in Arizona. Those $99 divorce websites that advertise with Google are often located in other states (and sometimes, other countries). Good luck finding a human to speak to! But you can call us, locally, anytime at 602-283-3800. Our Arizona Certified Legal Document Preparer will prepare your initial documents within 24 hours of your order! Arizona native Jessica Worley graduated from ASU with honors and her Bachelor’s Degree in Psychology in 2004. She is a certified Arizona legal document preparer with 13 years of paralegal experience. Jessica is passionate about helping people achieve their legal goals in the most timely and cost-effective manner possible. Not only did she work in Arizona law firms for 10 years, but Jessica has been through divorce herself and understands what you are going through. Cheap Divorce? Well, we don’t like that word, but yes. We are cut-rate: About 1/10th the cost of an attorney. Dirt-cheap may be a slight exaggeration. Why hire a law firm if you don’t need one? We believe everyone deserves to achieve their legal goals. But hiring a lawyer is certainly not cheap. We offer affordable Arizona legal document solutions that include the years of experience and superior customer service you deserve. Do you need a Cheap Divorce Service in Phoenix? Typically, if spouses are divorcing amicably (uncontested divorce), they are able to reach agreements among themselves and don’t need any further assistance other than the paperwork and complying with the Court’s requirements, which is where a legal document preparer comes in. Generally, the most cost-effective method to obtain an Arizona divorce without doing it yourself, is to hire a legal document preparer for a mere fraction of the cost involved with hiring an attorney. In Arizona, a legal document preparer must be certified by the State in order to prepare legal documents without the guidance of a licensed attorney. To be certified, the legal document preparer must have the necessary skills, knowledge base and years of experience to pass the certification exam. They must then meet the requirements of a stringent application process in order to ensure they do not have a criminal record and will act ethically. Legal document preparers are not attorneys and cannot ethically offer any type of legal advice. A quality Arizona legal document preparation company will gather information from you, inform you of your available options and then, based on the options you select, prepare the necessary divorce forms on your behalf. Many times, legal document preparers will also offer services for filing your paperwork with the Court and process service of your spouse. Make sure to determine what services are included before engaging a legal document preparer. Keep in mind that this route is likely your most affordable and time efficient option for an Arizona divorce. Having someone with experience and knowledge guide you through the process in an efficient and inexpensive manner can be an invaluable asset during a stressful and emotionally difficult period in your life- even if you are lucky enough to have an uncontested divorce. Hiring an attorney is typically NOT an affordable option for obtaining an Arizona divorce. In fact, it is the most expensive option and often ends up costing more than people ever imagine. Keep in mind that attorneys have paralegals (their own personal version of a legal document preparer) that do most of the work on your divorce. In that case, wouldn’t you be better off hiring your own legal document preparer to handle as much of your divorce as possible before engaging an attorney? This is the smart way to do it! That might not make sense for people with lots of assets, property and money in the bank. (But you’ll need to consult an attorney if you are not sure.) They may find that hiring a divorce lawyer is necessary, but it is simply not a financially feasible option for most Arizonans. An Arizona divorce attorney is going to require several thousand dollars up front to begin working on your case and will require regular and continuous payments until the conclusion of your case. If your divorce is resolved via litigation, it could take somewhere between six months to two years to be finalized. You will be required to continue paying your lawyer’s fees this entire time, unless you want to find yourself without an attorney midway through your case. Again, this is not inexpensive. Unfortunately, during divorce people sometimes allow their emotions to override common sense which ends up costing them even more. For instance, it does not make sense to pay an attorney their hourly rate, which will range somewhere between $200-$350 an hour, to resolve disputes over “stuff.” You will be charged for every single communication your lawyer has with you, the opposing party and/or their attorney, and the Court. And just imagine how that compounds when both spouses are paying lawyers. Hours of negotiating back and forth can end up costing more than the value of the items being argued over. If you are looking for a cheap or affordable Arizona divorce, it’s not going to happen if you hire the average Phoenix law firm. In addition, despite divorcing couple’s negative feelings toward one another, in most instances children benefit from having both parents actively involved in their lives. Many parents get caught up in having their attorney fight a legal custody battle that they will never win. Of course there are instances when sole custody is appropriate, but those must include extreme instances of drug or alcohol abuse, child abuse, criminal history, or domestic violence. Following the divorce, once parents gain some perspective, they often come to regret the malice they spewed at the other parent during the divorce, not to mention that their children’s college funds were spent on attorney’s fees, because in the end none of it was done in their children’s best interests. If you decide you must hire an attorney to represent you in your Arizona divorce, you should first research several attorneys. Begin by reviewing attorney profiles at sites such as the popular lawyer review site www.avvo.com, and also be sure to find out if an attorney has a history of discipline with the State Bar of Arizona by viewing profiles at https://www.azbar.org/FindALawyer. From there, make a selection of several lawyers to have a consultation with. A consultation allows you to meet with the attorney and get a feel for them and how they will handle your case. Make sure to find out about their billing practices and once you hire a lawyer be prepared for legal bills to being stacking up quickly. If you have reached the difficult decision to divorce, be sure to explore all your options. 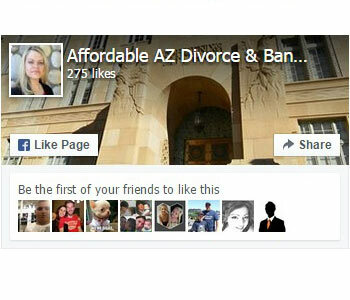 An affordable Arizona divorce is possible! If you have agreements in place with your spouse, a legal document preparer can likely handle everything from start to finish for you. Even if you haven’t reached agreements, a legal document preparer can still prepare the initial divorce petition and get the process started for you in a timely and cost-effective manner. After the process has started, you and your spouse might resolve any differences and thereafter have the document preparer finalize all documents and the process for you. Be sure to check out these money saving options before deciding to hire a lawyer. > Cheap Phoenix Divorce Attorney: Do They Exist? Although the majority of our business is divorce, we can help you with any Arizona legal document you may need help with. Formal or Informal probate; name changes; guardianship of child or adult. See our Probate Services page for more information. We can help you get incorporated in Arizona, become an LLC, or just file for a DBA. If you need help composing a legal Arizona Will, we are more than happy to help- and for far less money than an attorney. We can send a mobile notary to your home, to notarize any legal documents, almost anywhere in Arizona. Call for more information!